How exciting are tides and currents? Very exciting when you have an awesome teachers and Chromebooks. 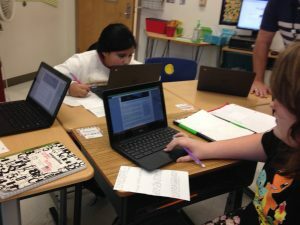 Students in Keith Pridgen and Francine Brewer’s 5th grade science classes are researching tides and presenting their information in various formats. They are working both independently and collaboratively to complete the task. To prepare technically for the unit, all users installed the Screencastify extension from the Google Web Store. This was done whole class and was completed within 5 minutes. 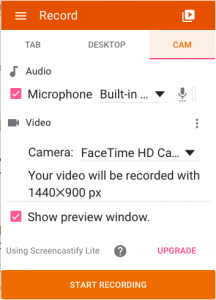 According to the Google Web Store, “Screencastify is a simple video screen capture software (aka. screencast recorder) for Chrome. It is able to record all screen activity inside a tab, including audio. Just press record and the content of your tab is recorded. So you can easily create a screencast for video tutorials, record presentations, etc. (Learn more here). Students were directed to explore the app and then were walked through some settings to make sure it will properly download and save into Google Drive. These settings will differ based on your school’s filter settings, whether you are a GAFE school, and whether students are using Google Drive. The unit began with a rubric for their presentation which provided voice and choice: choose your group partners, choose additional information to share, and choose the format of the final presentation. Instruction began with a brief overview of the most common terms the students needed to know. Because the teachers were using this unit as a jigsaw in which students will learn from one another, they provided the students with questions to be answered. 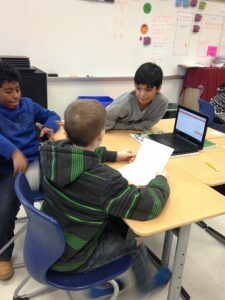 The students completed their research independently and then collaborated to create the final presentation. Students were given the options to present live with a slideshow (Slides), verbally through a recording (Vocaroo), or in YouTube fashion (Screencastify). Not surprisingly, this generation who cut their teeth on YouTube videos unanimously chose to do screen cast presentations. Because the students worked at their own pace, each group progressed to different stages at different times. 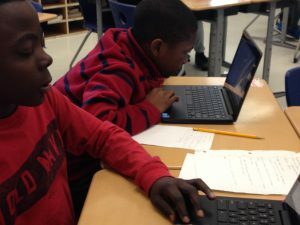 A group of boys was ready to attempt the screencast using Screencastify. They wanted to be the stars of the show, so they set up their Screencastify settings using the CAM tab with the built in microphone and the built in camera turned on. After getting the webcam lined up properly, the boys started their first take few takes. See the video below. After watching the preview, the students came up with the idea to use a second Chromebook to run as a teleprompter, so they wouldn’t be looking at their paper while recording. 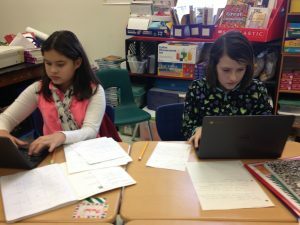 To complete this, the students were shown Google Docs and shared a file with one another. The next step is to complete the teleprompter file and then practice and record again.